Rose Reisman has a lot on her plate. She’s a nutritionist. And an author. And a caterer. And, earlier this year, she launched two meal delivery services: Rose’s Family Meals and Rose Reisman’s Personal Gourmet Cottage Boxes. She and her husband also raised four children. She understands busy. And she also understands the appeal of order-in apps like Uber Eats and Skip the Dishes. “But you never know what you’re getting [from restaurants]. I can tell you what’s going on behind the scenes.” Fresh and healthy is the motto for her delivery meals, and in general. Here, her tips for healthier meals and eating better. 1. Do make friends with salad. 2. Eat your biggest meal at lunch. Reisman finds that a lighter dinner makes for a better sleep, pointing out that digesting a big meal can take three to four hours and cause restlessness if eaten too close to bedtime. Plus, it gives your body time to burn off the calories before heading into a sedentary evening. Make as much for dinner but safe more for lunch leftovers! “Carb-bashing; I hate it!’ Reisman proclaims. She advocates portion control rather than elimination. Her service can accomodate intolerances such as that to gluten but she doesn’t believe in cutting out food groups. In addition to a salad, her prepared dinner deliveries come with a protein, a grain, vegetables and dessert. For information about getting the right amount of calories, protein, carbs and even fat each day, click here. Coconut oil has been heralded as a super food but, as Reisman points out, it’s also high in saturated fat – 12 grams per tablespoon in fact. It’s a case of getting too much of a good thing. Avocados and almonds are another example of good foods she warns against eating to much of. The former is a source of omega-3 fatty acids, which help lubricate joints, but just one avocado contains 29 grams of fat (44 per cent of the recommended daily intake). And almonds are 26 per cent carbohydrate. So even though they’re one of the best sources of the most easily absorbed forms of vitamin E, which can help protect against sun damage and cognitive decline, cut yourself off at 10-a-day she says. Here, recipes for one of Reisman’s three-course meals. 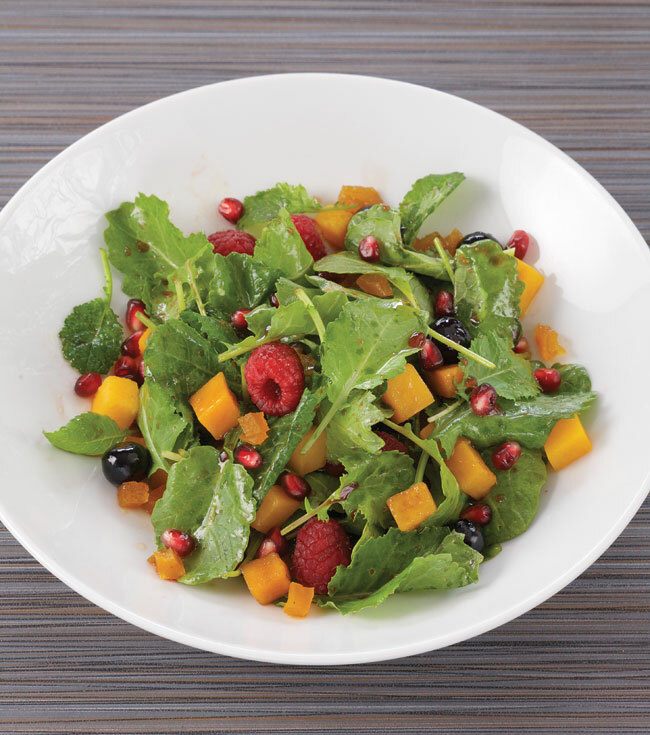 The combination and texture of the baby kale, sweet squash, berries and pomegranate seeds make this an exceptional salad not only in taste and appearance but in health benefits. I love to serve this as a main course by just adding some cooked chicken, fish or beef. Pomegranate juice can be refrigerated for 10 days and frozen for up to a year. Nutrition Tip: This salad explodes with nutrients. The baby kale contains protein and fibre and one cup of cooked squash has over 450% of your total vitamin A daily needs, which is needed for a stronger immune system. For Kids: This salad is so versatile you can replace any of the fruits and vegetables for your children’s favourites. If you want a sweet root vegetable, try sweet potatoes instead of the butternut squash and be sure to dice into very small cubes which is more appealing to kids. 1. Boil squash for 5 minutes just until tender. Drain. 2. Place kale on serving plate and add apricots, pomegranate seeds, berries and cooled squash. 3. Combine pomegranate juice, oil, vinegar and honey in small bowl. Add to salad and mix. Many varieties of trout are readily available. I prefer either Rainbow or Salmon Trout, which have a delicate and nutty flavour. 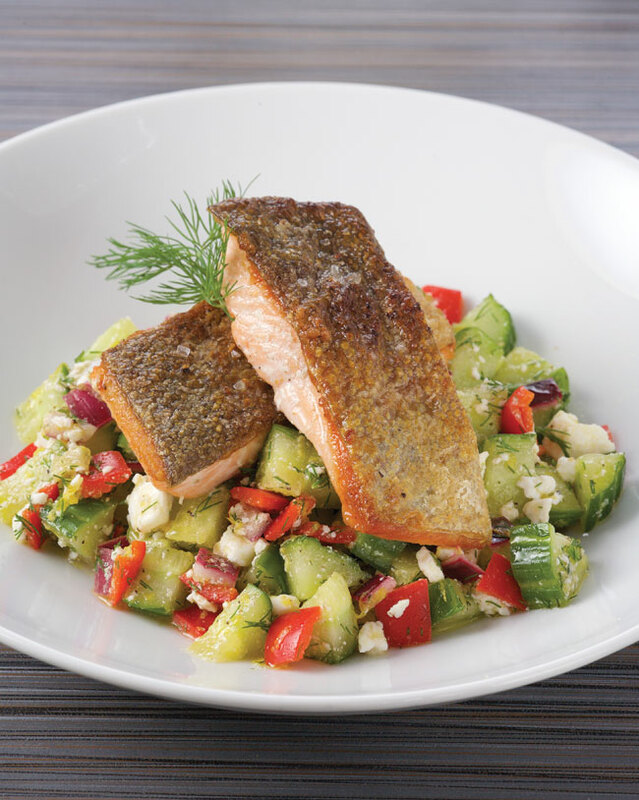 Trout cooks quickly and is a favourite among those who don’t like stronger-tasting fish, and goes particularly well with this flavourful cucumber salsa. Nutrition Tip: Rainbow trout are farmed primarily in freshwater ponds where they are more protected from contaminants and fed a fishmeal diet that has been fine-tuned to conserve resources. One 2.5 ounce (75g) serving of rainbow trout provides 128 calories. Trout is an excellent source of protein and has heart healthy omega-3 fatty acid. For Kids: Children usually enjoy trout due to its milder flavour and soft texture. Remove the skin from the fish. You can omit the red onions, if desired, and substitute a milder cheese such as shredded Havarti or mozzarella. 1. In a bowl, combine the cucumber, red pepper, feta, onion, oil, lemon zest and juice, garlic, salt and pepper, and dill. Spread over a serving dish. 2. Heat a large skillet over high heat. Lightly spray with vegetable oil. Place the fish skin side down in the hot pan and cook for about 3 minutes, just until the skin is crispy. Turn over, reduce the heat to medium-high and cook just until the fish is opaque and flakes easily with a fork. 3. Place the cooked fish skin side up on top of the cucumber salsa. Serve. 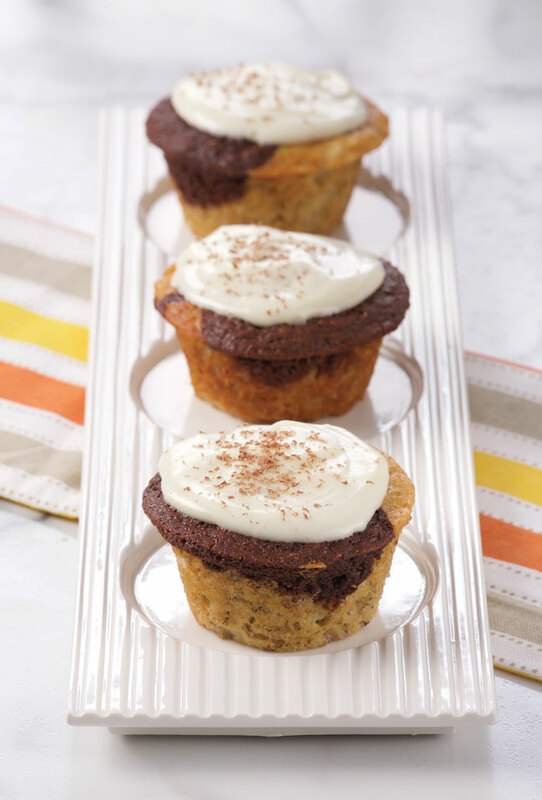 Everyone loves the combination of banana and chocolate, so I thought a cupcake with both flavours would hit the spot! These are delicious as a lighter dessert rather than a traditional piece of cake. The visual effect is attractive due to the marbling of the white and dark batters and the creamy icing. The best bananas are those that are overly ripe. I freeze these to always have a supply on hand. Nutrition Tip: A traditional cupcake is made with close to double the fat, which is usually saturated, such as butter, lard or vegetable shortening. There’s more sugar added, bringing an everyday cupcake to about 400 calories and 20 gm of fat, compared with my version that has about half the calories and more than half the fat. For Kids: This is a great dessert to let your children help with. You can also be making them understand why a cupcake like this is better nutritionally than the store-bought processed ones. 1. Preheat the oven to 350°F. Spray 12 cup muffin tin with vegetable spray. 2. To make the banana batter: combine oil and sugar in a large bowl or food processor; mix until smooth. Add egg, banana, and vanilla; mix until everything is well combined. In a small bowl, stir together flour, baking powder and soda. Add the flour mixture to the banana mixture in batches, alternating with the yogurt, just until combined. 3. To make the chocolate batter: combine oil, sugar, and egg in a large bowl; mix until everything is well combined. In a small bowl, stir together cocoa, flour, baking soda, and baking powder; add the mixture to the batter in batches, alternating with the yogurt, just until combined. 4. Divide the banana batter equally in muffin tin. Top with chocolate batter and bake for 15 minutes or until a toothpick inserted in the centre comes out clean. 5. Icing: In a small food processor puree icing sugar and cream cheese until smooth. Add a little water if too thick. Add a dollop to each muffins.